PBS has various film and curriculum highlighting famous women. Check out this slide presentation and discussion lesson, English and History: Women of the World. Scholastic has various interactive lessons that highlight famous women and classroom projects. Teaching History features lesson plans and quizzes. The Library of Congress has various primary sources including newspapers and images. Read Write Think has a variety of interactives and lesson plans for students. Check out this slide presentation, Forgotten Women in Tech History. Check out this slide presentation, 10 Women From History Whose Footprints Will Astound You! , which can be used as a writing prompt or discussion and research starter. The National Education Association has lesson plans for grades K to 12 supporting the 2017 theme, Honoring Trailblazing Women in Labor and Business. 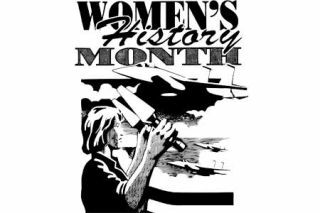 Here’s a list of quizzes for Women’s History Month. Check out this playlist to do a video lesson, Super Women of Our Past. You might also enjoy this playlist, Celebrate International Women’s Day. Also, check out this playlist, Celebrate Women’s History Month. Challenge: Use one of these resources to inspire your students by the women of history who accomplished great things.